Q. Where can I find resources for my opinion/pro-con essay? The best database for finding information on both sides of an issue is Opposing Viewpoints in Context. Opposing Viewpoints focuses on controversial issues and "hot topics." This database guides you to opinion essays, scholarly articles, statistics, selected web sites, and more. 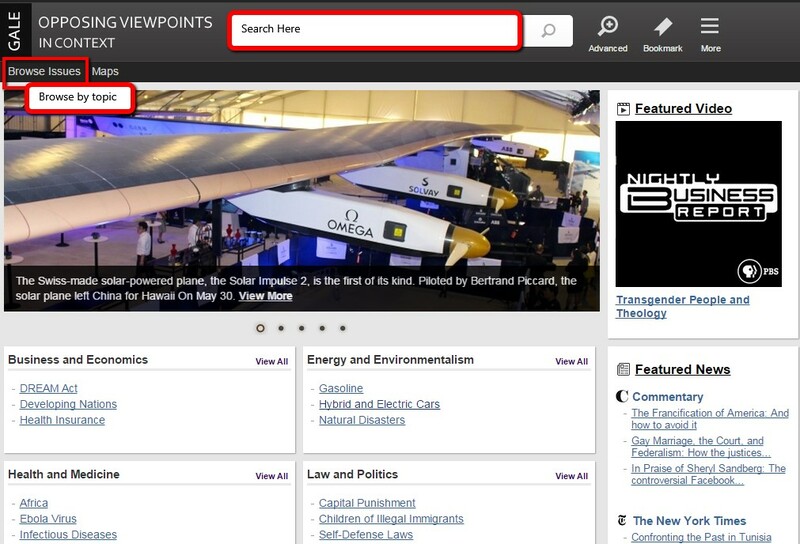 To access Opposing Viewpoints, click the Library tab in Engage/Canvas. Then select “A-Z databases." You can search by Subject or by selecting the letter of the database. Opposing Viewpoints in Context is the premier online resource covering today’s hottest social issues, from capital punishment to immigration, to violent video games. This cross-curricular research tool supports science, social studies, current events, and language arts classes. It’s informed, differing views present each side of an issue and help students develop information literacy, critical thinking skills, and the confidence to draw their own valid conclusions.